Amir Khan’s dreams of a potential fight with Floyd Mayweather took a huge hit following his split decision loss to Lamont Peterson in Washington DC on Saturday. 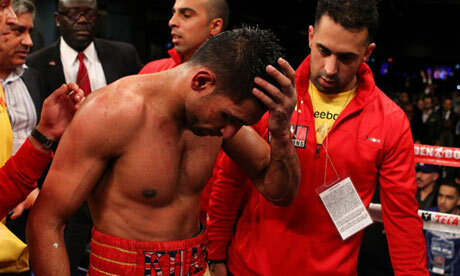 Khan, who lost his IBF and WBA light-welterweight titles, was controversially deducted two points for consistent pushing despite numerous warnings from the referee. Khan stated pre-fight that this would be his last fight at the 140 weight class before moving himself up to the 147 division. And he wasted little time in springing into action as he floored Peterson twice in the opening round. The first knock down was, however, ruled as a slip. That would prove to be one of the few highlights Khan had throughout the fight as Peterson, roared on by the home crowd, constantly backed up the champion and landed with some fantastic shots to the body. Instead of using his boxing ability and reach, Khan began to stand toe-to-toe with the American and began getting tagged with left hooks and uppercuts. Khan was deducted a point in round 7, drawing a furious response from promoter Oscar DeLa Hoya at ringside, and again in the 12. If I’m honest I did have Khan winning by 1 round after the fight had finished but there is no doubt it was a poor, poor display from Khan. His trainer Freddie Roach, who had worked with Peterson and the America Olympic boxing team, knew that Peterson would target the body but it looked as though they didn’t expect this. Khan was on the back foot for most of the fight and to an extent was “running” away from Peterson. Serious questions must be asked about Khan’s lack of fighting on the inside, any sense of defence and also his lack of power. Khan has never been considered a power puncher but does posses a good KO ratio. The problem, at least to me, is that Khan throws these “pity-patty” flurries which are still very amateur-ish. Yes they look great because of the speed but there is no power behind them. Khan has to learn how to sit down on his shots more. If he doesn’t, this would be a real worry against top class opposition at the 147 division. He just simply wouldn’t have the power to hurt those guys. Another real worry for the Khan camp has to be his inability to defend himself properly. Against these pressure fighters he allows himself to get caught back onto to the ropes too easily and doesn’t display any good head movement or defensive ability. Khan also needs to stop getting himself into these toe-to-toe battles to prove his “chin”. His chin has been tested and he’s taken some big, big shots (Maidana and Peterson). But, regardless of what he says in the media, Khan was rocked in both of those fights. They say the best chin is the one that isn’t tested. Khan has to take note of that. Team Khan need to take a serious look at themselves and work on these weaknesses. Otherwise talk of any potential fight with a Mayweather or a Pacquaio looks even more foolish. James DeGale and George Groves met on Sky Sports Ringside last night to discuss their upcoming fight. After watching these two go at it, I can’t wait for the May 21st showdown. You can literally feel the animosity between the two and I can see this ending in a KO for someone, with my money leaning towards DeGale at this stage. I must admit, even though I am a DeGale fan his antics on Ringside left me feeling a bit annoyed. 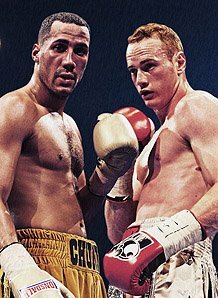 DeGale came across as childish, while Groves seemed very focussed and much more grown up. But it did remind me of the build up between Floyd Mayweather and Ricky Hatton with Mayweather boasting and bragging while Hatton remained calm and collected throughout. And we all remember what happened with that fight. Simple question for boxing fans; Who are YOU picking? vote in the boxing poll selection or feel free to leave comments.